New 8 megapixel Sony Ericsson phone? 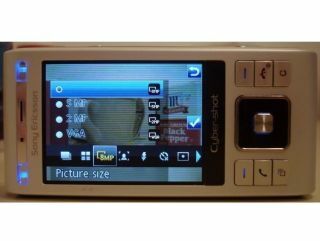 Sony Ericsson could be stepping up the mobile megapixel game to 8MP if new rumour shots are to be believed. In a very detailed piece, the new C905 - codenamed Shiho - is sporting an 8.1 MP camera with a bunch of snappery-related gubbins such as auto focus, face recognition, image stabilisation and a new thing called SmartContrast. Essentially this seems to be putting the phone firmly in the camera category…this is a better snapper than a £200 model two years ago. The phone itself - a slider, don’t you know, something we don’t see often in the K/C series from SE - has a GPS for geo-tagging of photos, and the lovely accelerometer for landscape switching. Apparently both a Xenon flash (those used in ‘proper’ cameras) and a PhotoFlash (an LED that can also be used during video capture. A 2.4 inch QVGA resolution screen helps to show off your photography skills, or there’s an optional TV out for those who like to really brag. After that, we’re getting into standard connectivity for high-end phones - WiFi, Bluetooth 2.2, USB 2.0 AND can be synchronised with Exchange ActiveSync for push email from your office. Apparently due to be released in early Q4 this year.